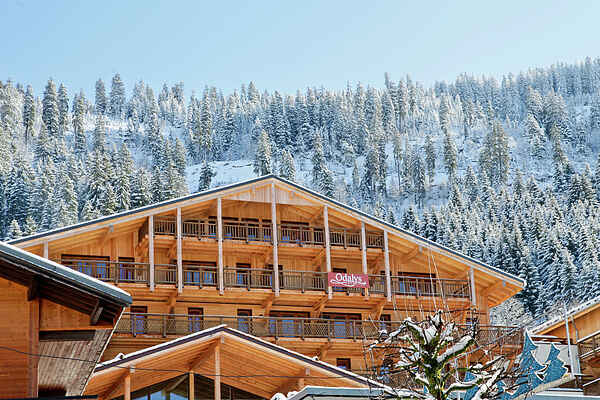 Chatel is a charming ski town in the Les Portes du Soleil ski area. It is located in the North Alps, roughly 75 km from Geneva and connects France and Switzerland's most beautiful ski slopes. The stylish residence is situated in the centre of town, approx. 50 m from the Super Chatel gondola lift. Guests have free access to the heated, indoor swimming pool with jacuzzi and may use the spa (Turkish bath, massages, and treatments) for an additional fee. Each apartment is allotted a parking space in the garage. The apartments are located in the three chalets. They are all furnished in a comfortable, contemporary style, and each one features an open-plan kitchen and a balcony or terrace. The living room has space for 2 people to sleep. There are a selection of apartments for 4 to 10 people: FR-74390-111 is suitable for up to 4 people; FR-74390-112 is suitable for up to 6 people (sometimes in a duplex layout); FR-74390-113 has two bedrooms and is also suitable for up to 6 people (sometimes in a duplex layout.